Two small U.S. Navy boats with 10 sailors on board were being held by Iran Tuesday after possibly drifting into Iranian waters, officials said. But the U.S. said it has received assurances that the sailors will be allowed to continue on their journey to Bahrain. It's believed that at least one of the boats had mechanical problems and that both of the boats may have drifted into the Iranian waters, a U.S. official said. The craft were supposed to have been refueled by another U.S. Navy ship in the Gulf so that they could complete their journey from Kuwait to Bahrain, the U.S. official said, but they never made it to the refueling craft. A senior defense official said it's believed the vessels -- carrying nine men and one woman -- will be allowed to resume their voyage to Bahrain in the morning local time, as traveling through the waters would be safer in the daylight. According to Iranian media, Iran's Revolutionary Guard Corps said the U.S. military vessels were carrying armed personnel when they entered Iran's waters and were seized by IRGC naval units. The vessels were then transferred to Farsi Island. A senior defense official said the U.S. lost contact with the craft earlier in the day. "We subsequently have been in contact with Iranian authorities who have informed us of the safety and well-being of our personnel," the senior defense official said. "We have received assurances that the sailors will promptly be allowed to continue their journey."" 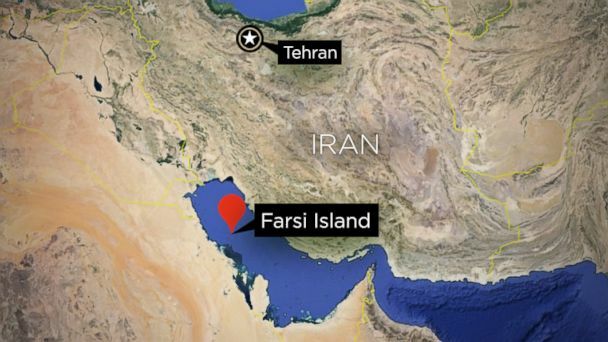 Another U.S. official said that it appeared the Riverine vessels were tracked in the territorial waters of Iran near Farsi Island. The U.S. Navy lost contact with the vessels, which have five sailors each, at that point. These vessels routinely operate in the Gulf, a senior defense official said. According to the official, the sailors did not appear to be aboard the craft and the vessels had not immediately resumed their travel to Bahrain. A U.S. official told ABC News it's the Iranian Revolutionary Guard Corps Navy holding the Americans, adding that the communications with the Iranians have been "very professional." A senior U.S. official told ABC News that Secretary of State John Kerry spoke today with Iranian Foreign Minister Javad Zarif about the issue. White House Press Secretary Josh Earnest said on CNN the White House is "watching this closely" and he stressed that the Iranians have assured the U.S. that the sailors are safe. Obama has been briefed on the situation, said a White House official. According to Deputy National Security Adviser Ben Rhodes, the boats were on "patrol in the Persian Gulf," a situation they were tracking "very closely." "We are working to resolve the situation," Rhodes said, adding that they "are hopeful that it will be resolved." This is not the first time Iran has seized western sailors in the Gulf. In March 2007, 15 British sailors were detained by Iran off of Iraq. Despite promises to return them, the sailors were held for 13 days. Additional reporting by Justin Fishel.